A flat tummy for you: This smoothie is a cross between a juice and a smoothie, so you get double the benefits. Greens are power-packed with Antioxidants and will help boost your immune system. 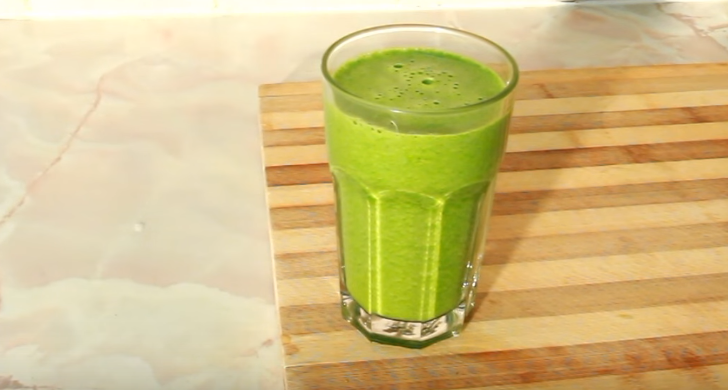 The high fiber content of this smoothie will help with bowel movement. You will also feel full fast and will eat less! (Constipation creates bloating and your tummy will look bigger). A medium Apple contains around five grams of fiber. Compare this to bran cereal which has about seven grams a serving. Cucumber will re-hydrate you as it is full of water and is low calorie. Spinach is a low-calorie food and has ONLY 7 calories per 1 cup of raw leaves, yet it offers twice as much fiber as other greens and it will fill you up. Cilantro and parsley will help you cleanse and detox. They will stimulate digestive assimilation and relieve constipation. One-fourth cup of cilantro has only 1 calorie. Lemon juice is one of the top fat flushers by boosting your body’s detoxification process. It may help you lose weight but it isn’t a miracle cure. It is one component of a healthy weight-loss plan. Avocado is highly nutritious fruit and will help you get all the nutrients and will help you manage your weight. Cayenne pepper and Turmeric: even though you probably don’t think of spices as weight-loss enhancers, cayenne, and turmeric show promise in reducing appetite and increasing energy. Ingredients: Make sure all they are organic and that the water is filtered. Blend all the ingredients at once. Try to make this 4 to 5 times a week for breakfast or lunch. Enjoy! Q: Can I use the “bottled water”, those sell in the supermarkets like brands “crystal” “spring water”? A: Please use filtered water or pure water. Try to avoid plastic bottled water. Q: Can you please let me know how this smoothie works because I can notice going to the toilet to frequently since I started drinking it. A: You will urinate more which is a good sign that you are flushing out toxins. Make sure you eat real foods and stay away from processed foods and refined sugar. Q: Can use coriander in place of cilantro? A: You need to use “fresh” cilantro or “fresh coriander” in the form of herbs. Not the seeds. Q: Is there a way to reduce the spiciness without reducing the number of ingredients. A: You can reduce and adjust to your taste. Remember the spices have potent health benefits. Cilantro is not spicy and has healing and cleansing benefits. A: You need to drink this 3 to 4 times a week. Remember this is not a “miracle weight loss cure”. You need to adopt a healthy lifestyle. Eat fresh, stay away from heavy and processed foods. Include exercise and stay active. Q: How many times a day do I drink this? A: Try to drink this once a day instead of breakfast or lunch. Please talk to your health practitioner before changing your diet.